I haven’t been to the University District Farmers’ Market for quite some time. And I’ve missed it. But other obligations have been keeping me away. Today, I returned and what a perfect day to cruise around the booths savoring the first signs of spring! It’s early in the season and the fresh-from-the-garden fare is limited but still there’s quite enough that I could overbuy if not careful. I kept a tight reign on myself this morning. One of my purchases was a bunch of big radishes. 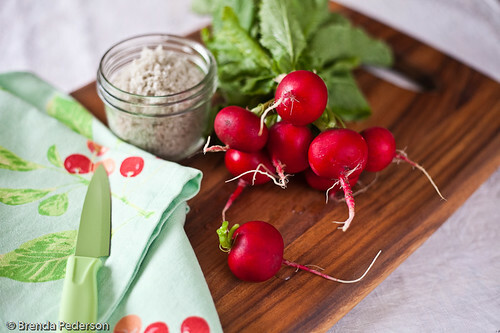 I love radishes and I’ll probably eat this bunch in one sitting. They really don’t need anything but I like to dip them in salt. The French slather them with butter and then dip them in salt. That’s good, too, but I really like them with just salt best. Fresh, crisp, sweet and spicy. They wake you up. They remind you that spring is here and summer is not far behind.